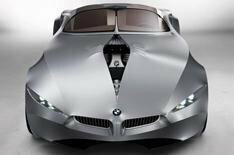 BMW shows the very fabric of a supercar | What Car? This is the BMW Gina Light Visionary, a car that pundits are saying could become a supercar, but which is more immediately striking for having a fabric body stretched over a spaceframe chassis. Unveiled today, the roadster is shrouded in a flexible, durable fabric. BMW engineers say that the spaceframe is strong enough to give ideal chassis dynamics and meet safety criteria without the need for metal body panels. As a result, the driver can change the car's shape by pushing a variety of buttons that move the fabric skin. The headlights, for example, hide under the skin unless they are turned on, when the contours of the front of the car change to reveal them. However, rumours that it could be the first step towards producing an Audi R8-rivalling supercar persist.